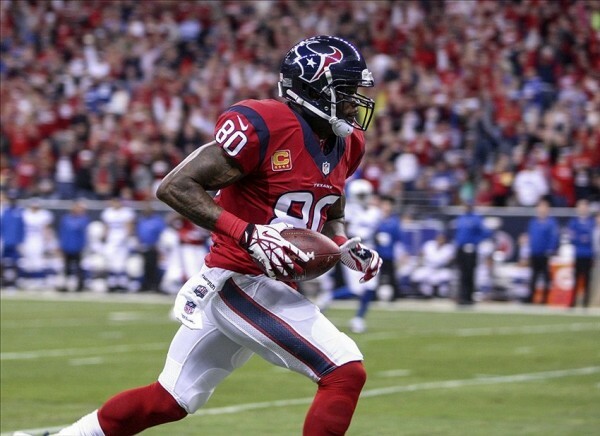 The stated unhappiness with the direction the Houston Texans are taking heading into the 2014 NFL season means that Andre Johnson, at the very least, should be considered as a trade option. It’s still far away from actually acting on his words, but you can never really know what sets a player and a team off on their separate ways. In terms of financial benefits only, without considering replacing his production or letting go of the greatest player in the history of the franchise, trading Andre Johnson makes sense for the Houston Texans. He is signed until 2016, but like every NFL contract, the details make it a lot more complicated than simply keeping a player for the next three years. He carries a salary-cap charge in 2014 of $15,644,583 and a cash contract value of $11 million. If the Texans trade him before June 1, his cap charge would be $11,964,166 representing a savings of $3,680,417 against the cap. If they trade him after June 1, would take a $4.644 million cap charge in 2014 and a $7.319 million charge in 2015. Regardless of if and when they trade him, that move is going to help their cap situation rather than hurt it. How about actually on the playing field? Johnson isn’t happy with the lack of talent around him (DeAndre Hopkins isn’t enough for him), so the first guess would be no, moving him wouldn’t be too beneficial from a purely football standing point. But are there actually teams that can absorb this kind of contract? The Bengals, Eagles, Packers and Colts have the cap space necessary, but all four of them seem pretty set with the wide receivers they have when thinking about potential contenders, as Johnson would like to play for a team that will make or at least is aiming at the playoffs, not a rebuilding process. Then there are the fringe teams who are in the same position as the Texans are more or less – all in the AFC East, with the Jets, Dolphins and Bills. The Bills aren’t going to be interested, and the Dolphins have a lot of money invested in wide receivers already. The Jets? This doesn’t seem like a move they’ll make. Unhappy or not with this potential rebuild, Johnson isn’t going anywhere most likely.